Demand for optics was jittery in 2018, but the quarterly sales of optical transceivers were steady during the year, as shown in the figure below. Volatility in demand for datacom and telecom products were “out of phase,” reducing fluctuations in the total sales. A decline in the telecom segment was compensated by strong demand for Ethernet optics in the first half of the year. Sales of telecom products picked up in H2 2018, just in time to offset lower sales of the datacom products. Detailed data on quarterly shipments and pricing of more than 100 categories of optical transceivers, AOCs, EOMs and WSS modules is included in the QMU database released along with the report. It should be noted that demand for WSS modules, EDFAs, pump lasers and passive components, not included in the chart above, were strong in 2018. These modules are usually deployed in the early stages of network upgrades, so this is a leading indicator of strong demand for telecom transceivers in 2019-2020. Sales of 25G optics for wireless fronthaul and new DWDM transponders picked up sharply in the end of 2018 and this trend should continue this year. 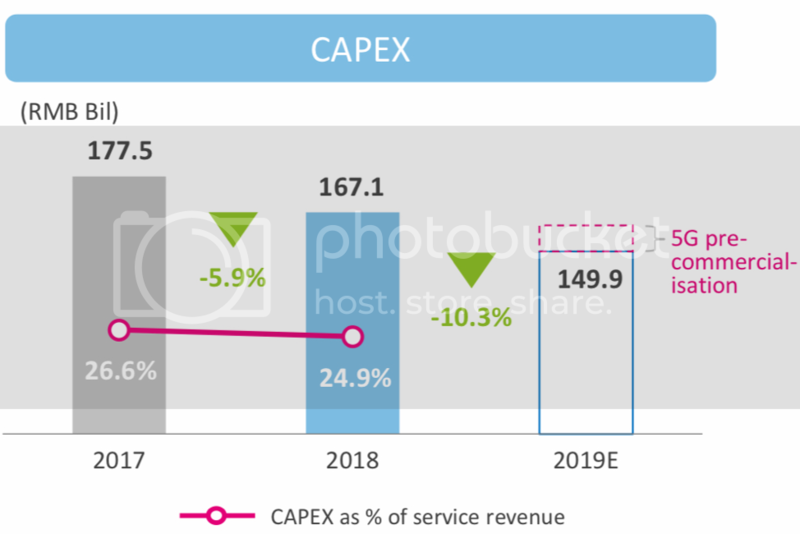 China Mobile disclosed 2019 capex plans earlier today, projecting 10% lower spending, as shown in the figure below. However, this excludes spending on 5G infrastructure, loosely defined in a pink dashed rectangle, sized at around $22 Billion RMB – adding 15% to the capex. China Telecom and China Unicom plan to increase their capex in 2019 by 4% and 29%, respectively, with 10-15% of the total to be spent on 5G infrastructures. All this adds up to 38 billion RMB in 2019 – just a few percent of more than 1 trillion RMB to be spent on 5G in 2020-2025, but it is a start. Google recently disclosed plans to spend $13 billion on construction of data centers in 2019. This is very good news for suppliers of 100GbE transceivers that reported sharp declines in Q4 2018 revenues. Facebook’s new F16 datacenter network design, released at the Open Compute summit last week, also suggests that a lot more 100GbE connectivity will be needed in the future. Detailed data on the sharp drop in shipments and pricing of SR4 and CWDM4 100GbE transceivers is included in the QMU database, available now. An updated forecast for sales of these products in 2019 will be released in the High-Speed Ethernet Optics report to be published next week. The QMU report also includes performance metrics and commentary for top-tier telecom and internet service providers, network and datacom equipment makers, optical component and semiconductor IC vendors. More information on the report is available at: https://www.lightcounting.com/marketupdate.cfm.